Mention “North Carolina vacation” to most Richmonders, and we automatically think beaches of the Outer Banks or mountains of Asheville. But Charlotte? Hmmm. Not so much – right? But let’s say you’re heading toward Charlotte – maybe you or your spouse have business in the city (it is the second largest banking hub after New York City), your sister lives on the outskirts, or you’re passing near Charlotte on your way to a final destination. 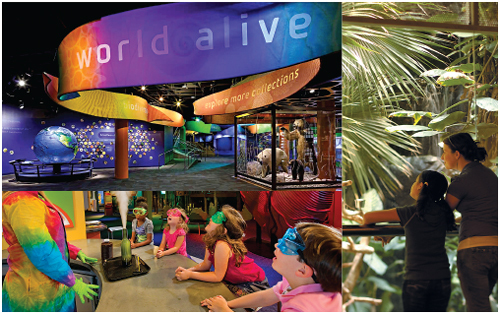 You should grab the chance to explore this family-friendly city for a day or (easily) a week. You’ll quickly discover why Charlotte has blossomed from kind of snoozy to super-sensational! Our tour begins in the Queen City’s chic – and booming – Uptown. This gorgeous, walkable slice of Charlotte is layered in fountains, rental bikes, kiosks, museums, restaurants, wine bars, coffee houses, bakeries, luxury hotels, and … you get the picture. Plan to park in Uptown? (Good luck with that!) Kidding, but here’s one approach: If you’re spending the entire day in Uptown, leave your car in Discovery Place’s fabulous parking garage, and walk, or use Charlotte’s easy light-rail system to see the rest of the area. Parking is $15 for the day. My kids have been over-the-moon about CARS, the movie, since it made its debut. (Never seen CARS? Rent it today.) My point: if the thought of touring the NASCAR Hall of Fame makes you stifle a yawn, go anyhow! Your little vehicle fans will be ecstatic to get up close to car-royalty – and you’ll snag great photos. Before entering this impressive homage to NASCAR, you’ll enter a beautiful 275-seat theatre and be treated to a fascinating movie that details how NASCAR developed throughout the last decades to present day. No spoilers, but know this: The presentation was so well done, I wanted to see it a second time. Once inside the museum, I marveled at the sophisticated design of “Glory Road,” where the exhibited cars are featured on a banked pseudo-road meant to look like they’re actually racing around a track. Kids also expect water on most vacations. Good news! You don’t have to leave Uptown Charlotte to cool off! On hot summer days, head for First Ward Park (301 East 7th Street) that sits across the street from ImaginOn. Kids chill in the interactive fountain, and play with a giant chess game and a huge Connect Four. Open from ten to eight daily in the summer. On South Tryon Street, you’ll find The Green. This triple-tiered emerald lawn features a literature theme, cool art, and plenty of restaurants. Kids can play under the three fish fountains that rain plenty of H20. If sports are your thing, your family can have a ball in Charlotte. BB&T Ballpark sits like a jewel at the foot of Uptown’s skyscrapers. 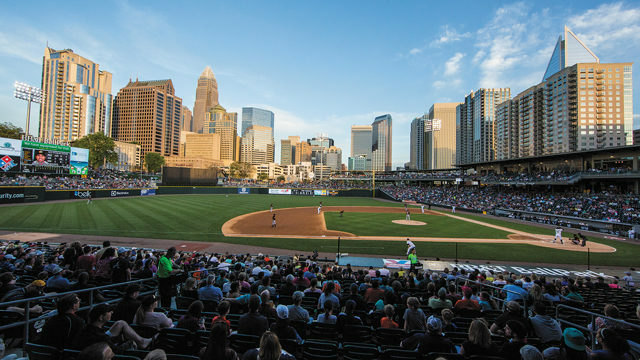 Home to the Charlotte Knights, a AAA minor league baseball team, the Knights play seventy-two games at home, and Sunday games mean kids get to run the bases. The park also has a Kids’ Zone with speed pitch and interactive games. Homer the Dragon – the Knight’s popular mascot – provides even more fun for families. Other sports in Uptown include the Charlotte Hornets – the city’s NBA basketball team – playing in the Spectrum Center if you’re in town anytime from the end of October through April. Football fans will want to check out the Bank of America Stadium that’s home to the Carolina Panthers, Charlotte’s NFL football team (a three-minute drive from the NASCAR Hall of Fame). Also in Uptown, when you’re hungry, take a 4-minute walk from Discovery Place – on wide, beautiful sidewalks – to the 7th Street Public Market. This lively indoor venue offers many casual eating choices including pizza, crepes, coffee, breads, and baked treats. a meal and a movie. The Charlotte Douglas International Airport is about six-and-a-half miles west of Uptown, and that’s where you’ll find the Carolinas Aviation Museum. Established in 1992, the museum has a collection of more than fifty aircraft, an aviation library with over 9,000 volumes, and a very extensive photography collection. In January 2011, the museum acquired the US Airways Airbus A320 landed by Captain Chesley Sullenberger (as US Airways Flight 1549) in the Hudson River on January 15, 2009. This aircraft is about thirty-five years younger than any other commercial airliner on display in a museum. Do you remember the story? “Sully” Sullenberger landed the plane in the Hudson River, saving all 155 passengers and crew members, and propelling himself into the annals of history. Today, Sully’s Airbus is housed in the Carolinas Aviation Museum honoring a heroic man who spun countless hours of training into one shining moment when he dared to land on a river, versus heading for an airport tantalizingly close, but too far to reach (tests later confirmed). Just inside the perimeter surrounding Uptown is SouthPark, the area of Charlotte where you’ll find the ultra-posh SouthPark Mall. Fair warning: It might get tricky pulling the kids out of the The LEGO Store and the American Girl Store! For grown-ups, there’s Louis Vuitton, Hermes, Tiffany & Co., and Nordstrom, to name a few. Shouldering the larger mall is Phillips Place, layered in fountains, iron lampposts, and flowers galore – it’s a beautiful backdrop for window shopping, just in case you’ve blown your vacation budget. This gorgeous mall features upscale shopping, upscale dining like P.F. Chang’s, a movie theatre, and the Hampton Inn & Suites. Charlotte is wrapped in a perimeter with Uptown in the center. The following venues fall outside of the city, but are an easy drive and worth the trip for families. My favorite spot in Charlotte? 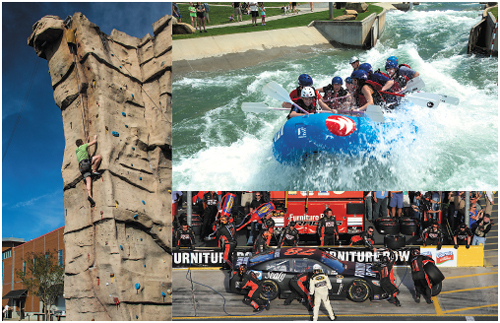 Hands down, it’s the U.S. National Whitewater Center. Perhaps it’s a response to those folks who only think of traditional beach and mountain vacations when they think of North Carolina. Rambling over 700 acres of land from the hem of the Catawba River, the center is about eleven miles from Uptown and delivers an unforgettable day of land and water activities. Located about fourteen miles southwest from Uptown (on the border of North and South Carolina) is Carowinds, a scream-machine amusement park that has rides for all ages. Visit Carowinds and you’ll swear you’ve been here before. Turns out, Carowinds is owned by the same company – Cedar Fair – that owns and operates King’s Dominion. However, there are enough differences between the two parks to make a visit a lot of fun. If you haven’t been to King’s Dominion in years (gasp! ), trust me, you need to get back there with the family. And yes, Carowinds is also perfect for families with kids of all ages. The park has thirteen world-class coasters, two of which made the tallest coasters in North America list (Fury 325 and the Intimidator). The park also has Boo Blasters, a river rafting water ride, and WindSeeker (the tallest ride built at Carowinds). And because North Carolina is the birthplace of stock car racing, you’ll also want to check out Charlotte Motor Speedway in Cabarrus County. Guess which cartoon-movie based on the maturation of one racecar had its world premiere at the Charlotte Motor Speedway?! That’s right! McQueen, Sally, Mater, and friends – from the CARS movie – were introduced to the world right here at the Charlotte Motor Speedway back in spring ’06. This complex features a 1.5 mile track that hosts NASCAR racing including the huge (huge!) Coca-Cola 600 on Memorial Day weekend, the NASCAR All-Star Race, and the Bank of America 500. The speedway is considered the home track for NASCAR with many race teams located in the Charlotte area. ZMAX Dragway, the only all-concrete, 4-lane drag strip in the U.S., is also here.